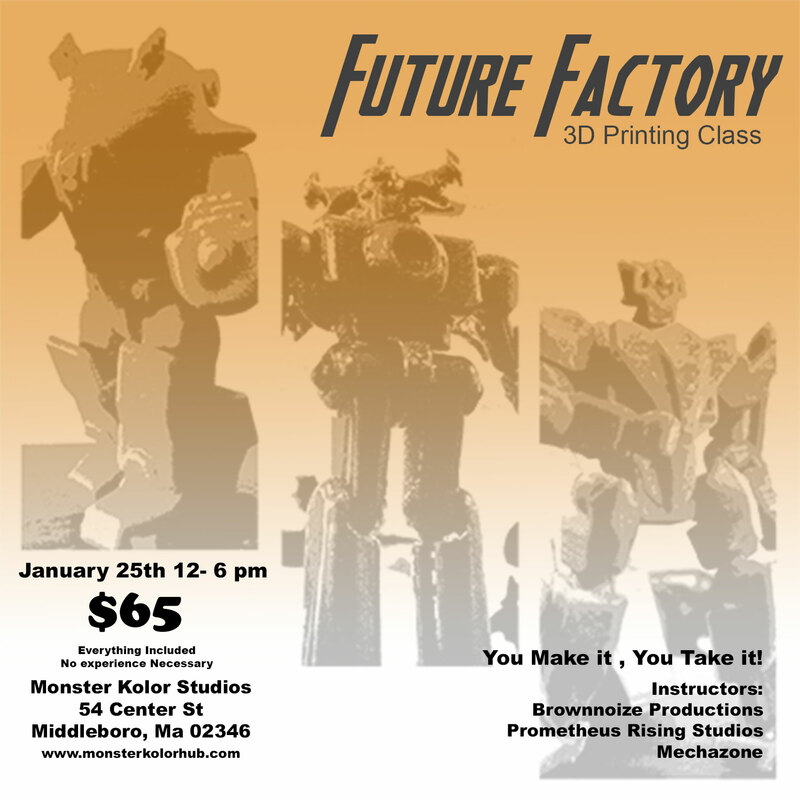 On January 25th, Prometheus Rising Studios, Brownnoize Productions, and Mechazone will be descending on the Monster Kolor shop in Middleboro, MA to spread the good word about 3D printing toys. We’ve been planning this for a while, and I could not be more excited to finally announce Future Factory, our first ever 3D printing class and live demonstration. Sanjeev, Dave, and I have been working for the last few months to develop new figures in each of our own styles that can be printed in a single afternoon. The three of us will be bringing our printers to the Monster Kolor shop for an afternoon of toy-making. For $65, participants will be able to chose from our three sets of designs and watch their toy be printed live while we discuss the process of designing and producing toys using 3D modeling software and printers. We will even give the finished toys an acetone vapor bath so they are smooth and shiny for you to take home. Due to time and equipment limitations, we only have eight slots available to leave with a newly printed toy, but others are welcome to come learn about 3D printing, and maybe even purchase other mecha toys produced by the three of us. You can purchase your spot from the Monster Kolor Store right now. Hurry, because tickets spots are selling fast. Even if you don’t get one, be sure to come down to the MK shop from 12-6PM on January 25th!